YWTF ATL Launches a Career Networking Group! In observance of Career and Mentoring Month, YWTF ATL Launches a Career Networking Group! This month we will focus on opportunities to enrich the careers of younger women through building resources and networks. We also plan to create mentorship outreach opportunities and build a library of professional development resources to share with our members. Join the Career Networking Group every 1st and 3rd Thursday of the month at 1159 La Vista Rd, Atlanta, GA at 7:30 am. This event is a special networking group targeted at younger women. This group will also feature monthly guest speakers and professional development. Purpose: Network and share resources, job leads, tools, referrals. • Bring business cards and elevator speeches. To RSVP, inquire about speaking to the group, or learn more information about this group, please emailywtfatlanta@wtf.org. Train with Shane delivers education, training and professional development in relation to current market conditions and the shifting, competitive business environment. We take the sales, marketing and motivational process and fundamentals and make them relevant with regard to your changing consumer, your new market environment and your business dynamics. Founded by Deborah Shane, master motivator and educator, whose passion it is to create and offer engaging and fun seminars and workshops, dynamic motivational speaking, customized corporate training programs and consulting. TWS can guide you and your team to discover and use new energy, approaches and inspiration that will elevate your company's vision, image and performance. Keynote presentations and break-out sessions during the Women’s Empowerment Series will provide mentoring, education and motivation from accomplished business leaders and female entrepreneurs and offer ideas and insight for succeeding in the changing business environment and economy. * Joyce Bone of MillionaireMom.com will speak on “The Three Keys and the Power of the Millionaire Mom Mentality.” Joyce Bone is the founder and CEO of MIllionaireMoms.com, a website helping women master the art of raising a business and a family. She co-founded EarthCare, an environmental company that grew from a $10,000 investment to a $50 million company in 18 months. She is a columnist for eWomenNetwork’s “Glow Magazine” and “Inside Gwinnett” magazine. She has been featured on CNBC’s “The Squawk Box”. 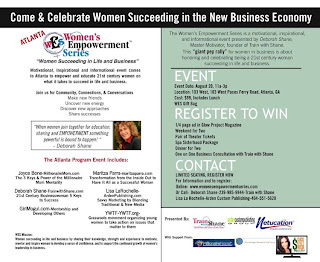 * Maritza Parra of MaritzaParra.com will present “Transformation from the Inside Out to Have It All as a Successful Woman”. Maritza Parra, also known as The Product Creation Queen, is an author, speaker, coach, syndicated columnist and Internet marketer. Parra trains and coaches entrepreneurs to use self-empowerment and the Internet to create financial freedom. After being featured on "Oprah & Friends: The Soul Series”, Parra became an expert at creating products quickly via teleseminars, e-books video and other product creation strategies. * Deborah Shane of TrainwithShane.com delivers her presentation, “The 21st Century Businesswoman – Five Keys to Success.” Deborah Shane is a motivational speaker and educator who founded Train With Shane to deliver education, training and professional development in relation to current market conditions and the shifting, competitive business environment. The model for Train With Shane comes from Shane’s collective experience in entertainment, teaching, sales and mentoring. * Lisa La Rochelle of ArdenPublishing.com will speak on “Savvy Marketing by Blending Traditional and New Media”. Lisa La Rochelle is the co-founder, chairman and CEO of Arden Custom Publishing Group which develops and launches multimedia publishing products such as print magazines, video magazines, and multimedia content and video products. GlowMagazine.org and GirlMogul.com are two of Arden’s products. * GirlMogul.com will make a presentation on “Mentorship and Developing Others”. GirlMogul.com provides positive, encouraging messages for Tween girls. * YWTF.org/Younger Women’s Task Force, Atlanta Chapter will focus on organizing young women to take action on things that matter to them. This grassroots movement is a project of the National Council of Women’s Organizations. They work to define and develop the next generation of women leaders and create a local and national network for peer mentoring and networking.